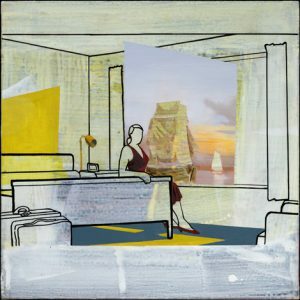 PROVINCETOWN — Reality slips and slides in Alice Denison and Catherine McCarthy’s painting show at Alden Gallery.McCarthy blends snippets of art history with the immediacy of facture. Pictures carry us away; paint brings us back. “The Revisionist” springs from Edward Hopper’s “Western Motel,” in which a woman sits alone, waiting. McCarthy renders the scene in clean black outlines atop a canvas already swiped and dolloped in white and whitish yellow. The woman’s red dress is opaque, as are shadows and light sharply inscribed on wall and floor. Elsewhere, the milky backdrop seethes to the surface, as if the material itself is the source of all our stories and illusions. Where Hopper’s picture window opens to hills and sky, McCarthy paints a plane projecting from the window, with a nautical scene poking right into the room. Other works borrow from 16th-century Dutch paintings. In “Hindsight,” a ship tosses on rough waters as a shaft of light opens a dark sky. Both wave and sunbeam venture out of the scene into a painterly column on the right. They become not water and weather, but brush strokes. McCarthy’s specificity and allusions startle and provoke, and then she always returns to the paint, a material stand-in for the loam of memory and imagination. Denison, meanwhile, gets so close to her vases that they become hallucinatory terrains of layered pattern. In “Pieces 1,” incandescent purple and blue smears of blossoms and ivy gather over the white and yellow flowers beneath. The artist has embossed and then sanded down yet another floral design in “Pieces 5.” It comes across in breaths of gold and shadows over a looping blue-on-white design. The two patterns harmonize — one nearly invisible, whispering over and through the one our eyes lock upon. As the ethereal entwines with the concrete, Denison at once pulls reality away and infuses it with flavor — and there, remarkably, in the layering of patterns on porcelain, we have a picture of longing.